In The Intuitive Proof of the Infinitude of Primes, I showed you a proof strategy called proof by contradiction. In this post, we use this strategy to prove that is irrational. In proof by contradiction, if the statement P is true, you have to assume the contrary, and then find a contradiction somewhere. Note that the proof in this post is very similar to the proof that is irrational. where and are integers with no common factor except 1. This means that is in lowest terms. Since is a factor of , this means that is divisible by . Now, if is divisible by then is also divisible by (we still have to prove this, but you can try) (1). Dividing both sides by , we have which means that is divisible by . This implies that is also divisible by (2). Now, in (1), is divisible by and in (2) is also divisible by This contradicts the fact that and have no common factors except 1. Therefore, the assumption is false. So, is irrational. 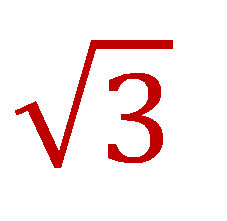 By the way, David Feinberg has written a nice poem about the Square Root of Three.